Submitted by Daniel Fehn on 07/10/2012 - 16:08. Like Jim Morrison himself, there are many legends and mysteries surrounding the history and whereabouts of his 1967 Mustang Shelby GT 500. Shelby fans have long sought after this car, with every few years reports surfacing of it being found, but the reports have never turned out to be true. The Blue Lady as Morrison named the car, was a gift from Elektra President Jac Holtzman in 1967 after The Door's self titled debut album was released and "Light My Fire" hit #1 on the music charts. Each band member was asked by Holtzman what they wanted as a "thank you" gift, with Robby Krieger and John Densmore requesting recording equipment and Ray Manzarek asking for a thoroughbred horse. Morrison thought the Shelby GT350 his hair stylist (Jay Sebring) had was the coolest car he had ever seen, and requested a GT500 specifically the way it was equipped. The car itself was a 1967 Ford Mustang Shelby GT500, Nightmist Blue in color, build #939. The interior was parchment interior rather than the typical black, which was usually ordered with the Nightmist Blue exterior. It was delivered late 1967, which means it had the rarer close set driving lights in the middle of the grill, which were changed to small rectangular lights shortly after to abide by federal regulations. The Shelby was not a "Super Snake", so it did not have any stripes (which were still an option, but not ordered), and had the rarer optional 10 spoke wheels. The engine was a 428 Police Interceptor with dual quad Holley carbs, in team with a 4 speed manual transmission. According to Marti Reports (the privileged licensee to Ford Motor Company's entire production database for the 1967-1993 model years), only 47 cars with the Nightmist Blue and Parchment interior were built. Although Jim dubbed the car "Blue Lady", and was said by many to love the car, he did not baby it at all. It was the only car he ever owned, and he beat and destroyed it like he did with many of his rental cars. Although he crashed it multiple times, he had it repaired each time. There are at least 5 documented severe crashes. In the biography for Jim Morrison titled "No One Here Gets Out Alive" by Danny Sugarman and Jerry Hopkins2, they document that the Blue Lady was involved in multiple major accidents, including one on La Cienega Boulevard which leveled 5 young trees. Each time the car was repaired, but sheet metal can only be bent and repaired so much. Hwy: An American Pastoral In early 1969, Jim Morrison wrote a 10 page screenplay and had it directed by Paul Ferrara. Jim plays a hitchhiker who kills the driver of the Mustang, and takes the car for some "hard" rides. 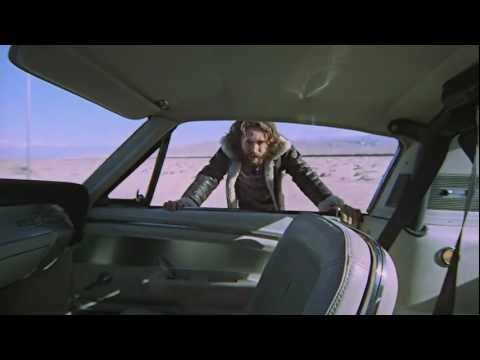 Excerpted from the documentary "When You're Strange", this short video has some of the car scenes from this movie which was never released. This video has been digitally restored for the above documentary, and there are quite a few videos on YouTube showing different parts of this movie. So What Happened to the Blue Lady? 1) The most told story is that he wrapped it around a telephone pole on his way to Whiskey A Go-Go, a bar he frequented and where the Doors played many shows. Frustrated with the extensive damage, he walked the short distance left to Whiskey A Go-Go and got his drink on for the night. When he returned to the scene later that night (or morning), the car had been towed away and he never followed up on it. 2) Another popular story is that the car was towed from LA Airport, where he parked it for an extended time during tours. It was then sold at auction and lost. Some stories mention the car was resold many times in California, and after multiple accidents it was crushed in the early 1980's. 3) Another story has him wrapping the car around a light pole near a police station much later than the Whiskey a Go-Go incident mentioned in #1 above. There has been no recorded documentation found to prove or disprove any of these stories. My personal belief is that the Whiskey A Go-Go accident likely happened much earlier, likely before the spring 1969 filming of the Hwy movie. I believe it is mentioned a lot only because it is a popular story, not the actual cause of losing the car. It's very possible #3 happened with the accident, and the car was taken to the airport where it was eventually towed. We will likely never know, and multiple writers have asked The Door's members, with no one having any information. I will make full disclosure that I am not looking for the lost Shelby, for a number of reasons. I likely couldn't afford it, plus it seems that there are a number of people searching for it and they may already have some "upper hand" knowledge or other details which put them far ahead of me. Brett Matteson, owner of shelbymustang.com and a classic car business, was able to purchase the original registration card of the carHe seems to be currently looking for the car and seems to have some good leads, which he won't share (neither would I). My Personal Guess at the Whereabouts Supposedly the Shelby Registry has checked against the CA DMV database, and the car has not been registered in California since 1969. This can only mean a few things. Either the car was moved to another state, it was immediately put in storage and never re-registered, or it was crushed and destroyed. My personal hunch is that the car is lost for good, likely crushed and destroyed long ago. The car was involved in many major accidents, possibly damaging the frame. It may have been repairable the first few times, but if the account is correct that Jim wrapped it around a telephone pole and never saw it again, this would be the likely scenario. These cars were expensive at the time (double the price of a standard Mustang), but it was only 2 years old and these cars were not collectible at that time like they are now. I can't see someone buying it to fix it with frame damage, possibly having multiple issues from the previous accidents. Jim Morrison was also not a "legend" at this time like he is now, so I don't think anyone would have kept the car just because it was Morrison's. If someone did have the Shelby in storage knowing it was Jim Morrison’s, and waiting for the right time to sell a celebrity car, I believe it would have been long ago. Interest in Jim Morrison and The Doors were rekindled after Oliver Stone's movie "The Doors" was released in 1991, and this would be a perfect time to sell the car at it's highest value. Another issue I don't hear mentioned by anyone is who actually still owns the car? Although Brett Matteson was able to purchase the original registration card, he only owns the piece of paper and not the car itself. The car was last registered to "James Douglas Morrison", C/O Johnson/Harband. Because there currently are no records of the car being re-registered or purchased after October 1969, I would have to think the car still legally belongs to the Morrison estate or the firm listed on the registration title. There likely could be a legal battle between the two even, as this car would likely be worth closer to a million dollars in my estimates (Perfect examples of this car have been auctioned for $350,000 by Barrett-Jackson). Maybe the owner of the car does not want to release it because they will lose it? If the car was scrapped as I believe, there's a decent chance that the engine and other parts may still be out there. Although the body and frame were likely destroyed, the engine was probably in ok shape and was worth some money still at that time. What do you think happened to The Blue Lady? 1. http://www.martiauto.com/ - privileged licensee (contract #5012) to Ford Motor Company's entire production database for the 1967-2007 model years. The person who holds the title is not in possession of the Shelby and is still looking for it. Tony either does not know where the Shelby is or is trying to throw people off the tracks by saying it didn't survive. The car survived and is 'around'. Timeless Rides is a simple site created by a classic car enthusiast. The classifieds section is free for all to post their collector car, limit to 3. Read all about Dan's story here.